Lovely Thimbleanna enquired recently and I realised I’d probably not actually mentioned that yes, we know (to a reasonable degree of certainty) whether it’s a Miss or Master on the way and the blue hue above will clue you in. 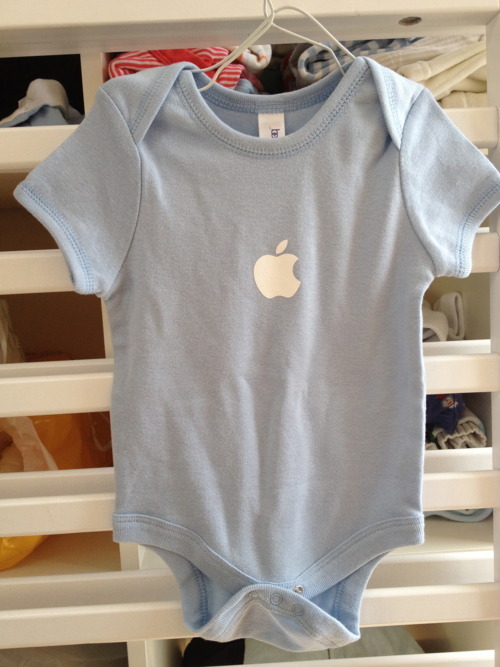 This was a gift from a friend who knows us well, who was visiting friends in Cupertino, CA and went to the Apple Store. Mr D probably won’t dress the child in anything else. It was really important to me to find out, if we could, for lots of reasons. Absolutely none of them relate to painting the nursery or splashing out on a gender-specific layette. I feel lucky enough to be having a baby without any complications thus far, including getting pregnant easily, in my very late 30s when the media had already conditioned me to think it would never happen. The nesting has started in earnest. As in: acquiring vital bits and bobs, clearing out the room, and you may be able to see the bars of the to-be-reassembled cot in the photo above. Twelve weeks seems like a long time before the little lad is here – but it’s really not!